Saturday September 30 1911 I got my work well along before By. Millie & Hattie came at 10.40 John came out with Will an hour later. It rained so By & Millie staid all night. A good visit Sunday October 1st 1911 The folks did not go down till 2.15 and I went with them. George & Will [Bremer?] were at Otts I came home at 5.30 to avoid a hard rain. Will & I talked all evening A month today since Dear Old Mother went away. 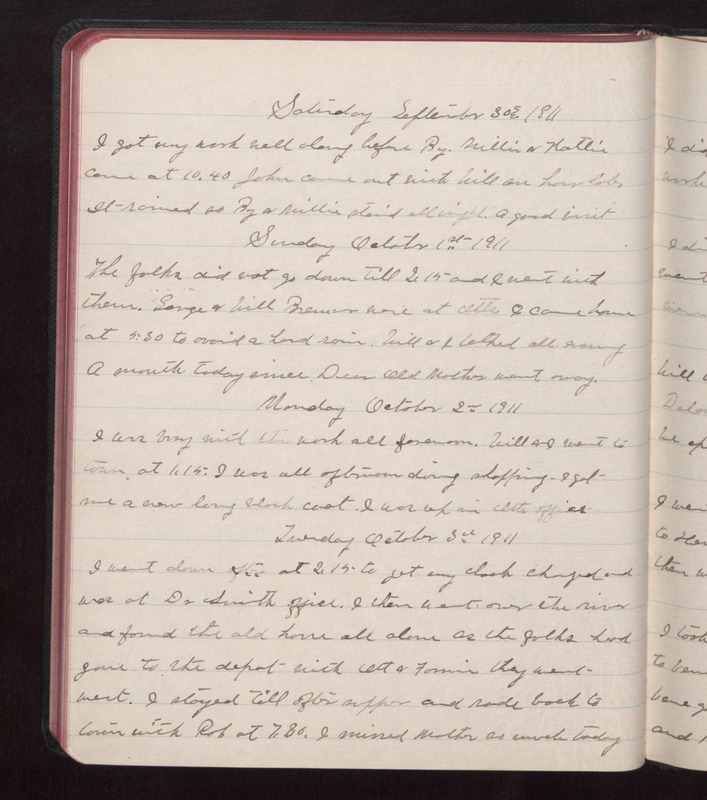 Monday October 2 1911 I was busy with the work all forenoon. Will & I went to town at 1.15. I was all afternoon doing shopping. I got me a new long black coat. I was up in Otts office. Tuesday October 3 1911 I went down at 2.15 to get my clock changed and was at Dr Smith office. I then went over the river and found the old house all done as the folks had gone to the depot with Ott & Fannie they went west. I stayed till after supper and rode back to town with Rob at 7.30. I missed Mother so much today.